In an incredibly welcome bold and adventurous move; Car Magazine have started experimenting with the concept of Augmented Reality! This is excellent news for consumers and even for the ailing offline media industry who have been hit considerably hard by the recent recession. Even though their foray into augmented reality is a small one; it is the start that is going to set Car Magazine apart from the rest of the magazines that play in this space. Augmented Reality is simply put; using the digital world to enhance the real world through the combination of the two. In other words you can use the camera on your smart phone or tablet; combined with specific augmented reality software to overlay an enhanced image of what you are looking at. So if you are looking at a car through your smart phone and your augmented reality software is geared to “read” the image; it can overlay additional information about the car such as engine size, kilo wattage, price etc. How have Car Magazine done it? 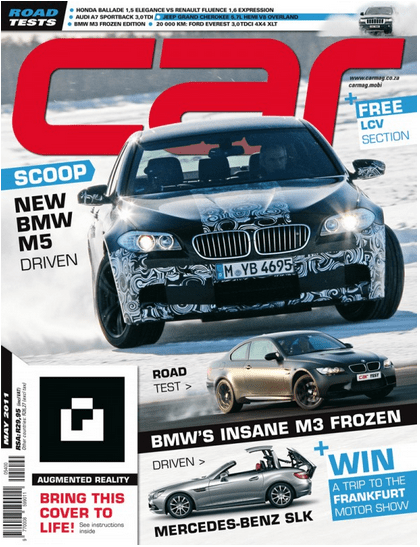 Car Magazine have inlaid a reference image on the cover of their May edition of their magazine. This image when viewed through the Car Augmented Reality Webpage; with your computers web cam activated, will display a video. Once you have watched this video, you can close it. This will then allow you the opportunity to click on any of the other feature stories on the cover of the May Car Magazine. The downside to all of this is that if you are not using 2x screens, you are going to have to juggle rather frustratingly between holding the magazine up to the camera and trying to see the screen. In fact, even if you are using 2x screens; let’s hope that you are ready to exercise some upper body strength as you need to keep the magazine up to the camera the entire time that you are trying to play with Car Magazine’s Augmented Reality. What will this do for Car Magazine? This will undoubtedly earn Car Magazine some “cool points” with their techno savvy readers and also push them ahead of the competition in terms of ensuring that they are giving their readers something new all the time. Whether this will get them some additional long terms subscribers is yet to be seen; but seeing this level of integration between offline and online marketing is truly excellent news for their current subscribers and even better news for the greater marketing industry. I look forward to seeing a lot more augmented reality features from a lot more offline media and cannot wait to see how they try to out do each other – which is inevitable! Giving away stuff for free… Does it build LOYAL followers?